State Department Spokesperson Heather Nauert only admitted the attacks were occurring after CBS News Radio first reported them August 9. Nauert told reporters at a delayed briefing that day, she had "some recent updates" on the incidents, but instead read nearly word-for-word from parts of the document that was prepared weeks, and likely months, in advance of the briefing. Top U.S. security official targeted in Cuba embassy "health attacks"
At the time, Nauert said she didn't believe the number of Americans injured was in the tens or dozens. But a source says that by the time the State Department first publicly acknowledged the attacks, it knew the reports of Americans injured had reached double-digits. "They for sure tried to keep the numbers secret," the source said. The State Department now says the incidents have affected at least 21 Americans -- which is higher than the first public tally of 16 that came two weeks after Nauert first addressed the attacks. The State Department responded to a request for comment only after this story was published. "Any suggestion that the department has been less than transparent with those affected by these incidents, their families or our colleagues in Havana is false," Nauert said in a statement to CBS News. "The State Department takes these incidents very seriously and is working with law enforcement authorities from across the U.S. government to determine their cause. We are employing every investigative tool possible. Our focus from the beginning of these incidents has been on the health and well-being of our personnel. They remain our priority." Global Affairs Canada has released even fewer details about Canadians affected. The attacks, which may involve the use of sound, began in late 2016, and investigators are probing whether covert acoustic devices targeting the diplomats caused a range of health issues including mild traumatic brain injury and hearing loss. "I think the U.S. government should be a lot clearer on what these diplomats have suffered," said Orlando Gutierrez, co-founder and National Secretary of the non-profit Cuban Democratic Directorate which pushes for reforms on the island country. Cuban officials in Havana and Washington have also been reluctant to answer questions about the attacks. A CBS News journalist sent to the Cuban embassy in Washington Tuesday described the response from officials there as "hostile." Cuban representatives at the embassy and the country's mission to the United Nations have not returned numerous phone calls and emails. 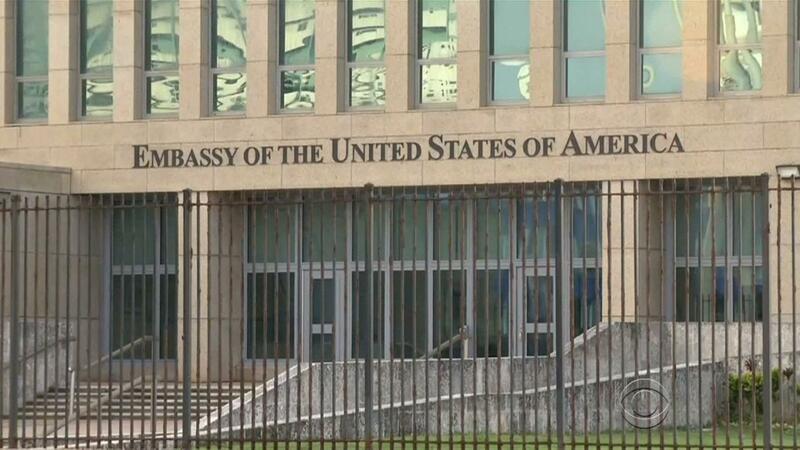 The foreign ministry in Havana has also clamped down on responding to the incidents. The ministry did issue a statement after top figures met with the State Department in Washington Tuesday, more than 12 hours before the U.S. issued its own brief response Wednesday. Cuba "strictly observes its obligations to protect foreign diplomats in its soil," the statement said. "Cuba has never perpetrated ... actions of this nature, and has never permitted nor will it ever permit any third-party." The attacks have perplexed intelligence analysts and experts on U.S.-Cuba relations. "It's baffling," said Phil Peters, head of the Alexandria, Va.-based, Cuba Research Center. It's clear that the attacks are threatening to upend the delicate détente between the U.S. and Cuba. In his speech to the United Nations General Assembly Tuesday, President Trump called the country's government "corrupt and destabilizing," saying the U.S. "will not lift sanctions on the Cuban government until it makes fundamental reforms." But the U.S. and Cuba still have reasons to continue their dialogue that opened under President Obama, on issues like drugs, migration and environmental threats, according to Peters. "We do have a need to talk to the Cubans," Peters said. "There's still a need to communicate." CBS News' Alyssa Rashaw in Washington contributed to this report.